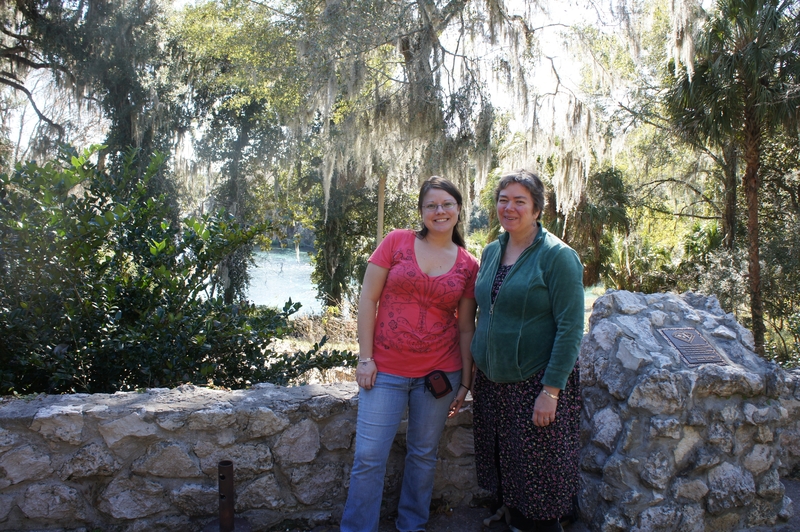 Two organizers who fought for the waters, plants and creatures of the Nature Coast, enjoying the source springs of Rainbow River. Geologists estimate that there are more than 700 springs in Florida, representing the largest concentration of freshwater springs on Earth. Most of these springs are concentrated in the northwestern portion of the peninsula, known as The Nature Coast, the heart of which was poised for clearing thousands of acres of forest and wetlands for one of the first proposals of the nuclear Renaissance. When Earth First! activists in Florida joined with local land owners and organizers around the state four years ago, it was hard to envision how victory could actually come about in the face of nukes being presented as the only alternative to fossil fuel. Today, thanks to social pressure and crumbling economies, there is a renewed trend: from Georgia to California, nukes are on their way out again—even ones that were already under construction. Six protesters were taken away in handcuffs earlier Thursday near the corporate headquarters for Duke Energy. 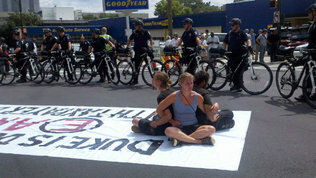 They had locked arms and were sitting on top of a banner claiming that the energy company was harming the environment. Two dozen officers surrounded them and eventually lifted up the protesters, who refused to move. They then put them into prisoner transport vans. Just before her arrest, 26-year-old Christina Mounce of Casper, W. Virginia, criticized the utility company for burning coal and running nuclear power plants. The demonstrators at Stonewall and Tryon streets said they were demanding an audience with Jim Rogers, the CEO of Duke Energy. As Hurricane Isaac made landfall in New Orleans on the eve of Hurricane Katrina’s seventh anniversary, climate justice organizers in Texas were locking themselves to the axle of a massive TransCanada semi-truck, carrying 36-inch pipes intended for Keystone XL construction, in hopes that they might turn the climate crisis around. 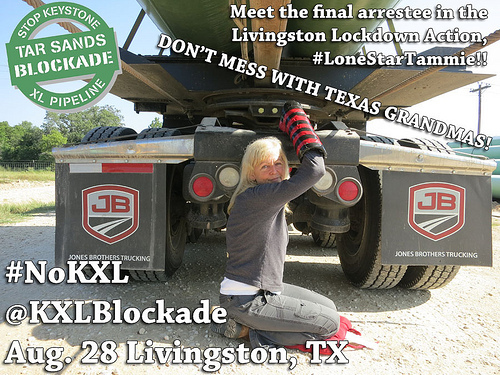 With help from TransCanada workers themselves, these six people were able to shut down operations at the Livingston pipe yard and cut off the transportation of pipes to construction sites across the southern leg of the Keystone XL pipeline after police were forced to dismantle the truck to make arrests. The action comes in response to a recent court ruling giving TransCanada the green light to steal a piece of Texas landowner Julia Trigg Crawford’s home. Lamar County Judge Bill Harris practically insulted this local farmer by sending a 15-word summary judgment to her from his iPhone in Washington, DC, August 15. About 1000 people pissed at corporate America marched in Charlotte, NC, yesterday, two days before the Democratic National Convention begins. According to police, two people were arrested, one for having a concealed knife and another for disorderly conduct. The demonstrators were members of more than 90 local and national groups. Mortgage foreclosures, high-interest student loans and environmental issues were among their foremost concerns. 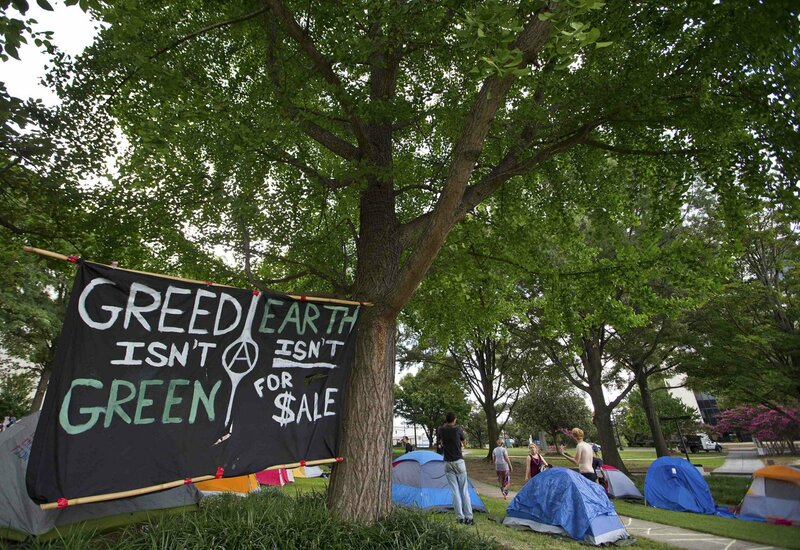 Occupy camp carries radical eco message from Tampa to Charlotte. 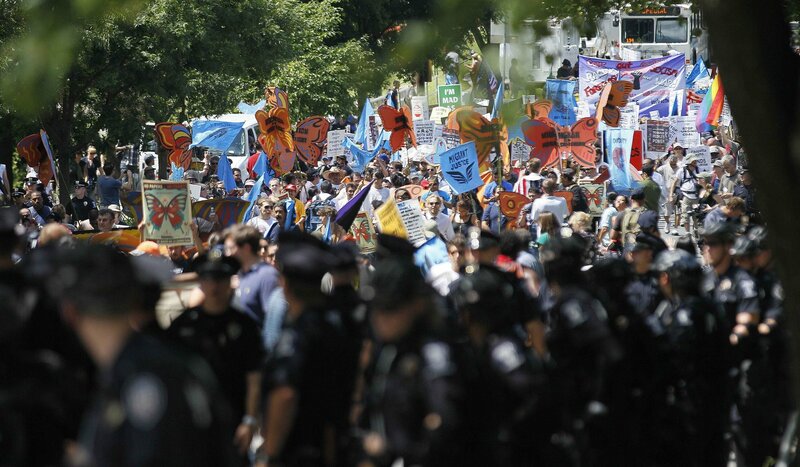 The protesters marched past the headquarters of Duke Energy, the nation’s biggest electric utility. Security was evident, with several hundred police officers also lining the sidewalks near the Bank of America headquarters. View of Omkareshwar Dam from Siddhnath Temple. 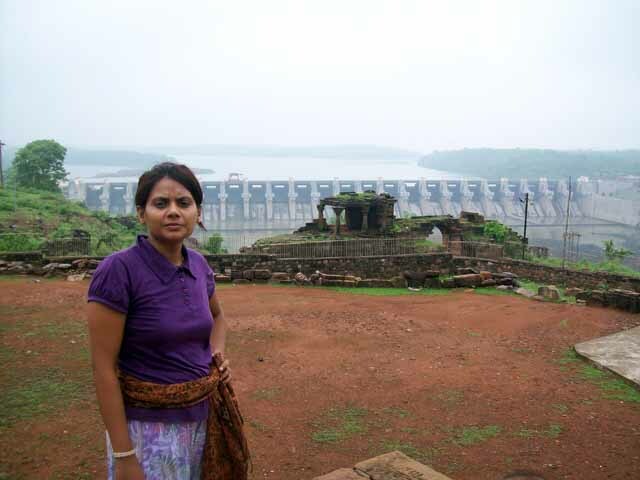 The Asian Human Rights Commission (AHRC) has received a report from the Narmada Bachao Andolan (NBA) that a large group of villagers who have been evicted from their land without compensation for the construction of the Omkareshwar Dam are sitting within the dam’s catchment area claiming that they are willing to drown to death than been denied their rightful claim for adequate rehabilitation for the lands they have lost. In the meanwhile, water level is increased gradually in the dam, that soon the water would submerge the protesters. The protest has entered the 10th day today. Seeking to prevent massive and irreversible environmental damage, numerous environmental groups have filed formal protests against the Programmatic Environmental Impact Statement (PEIS) for Solar Energy Development in Six Southwestern States. 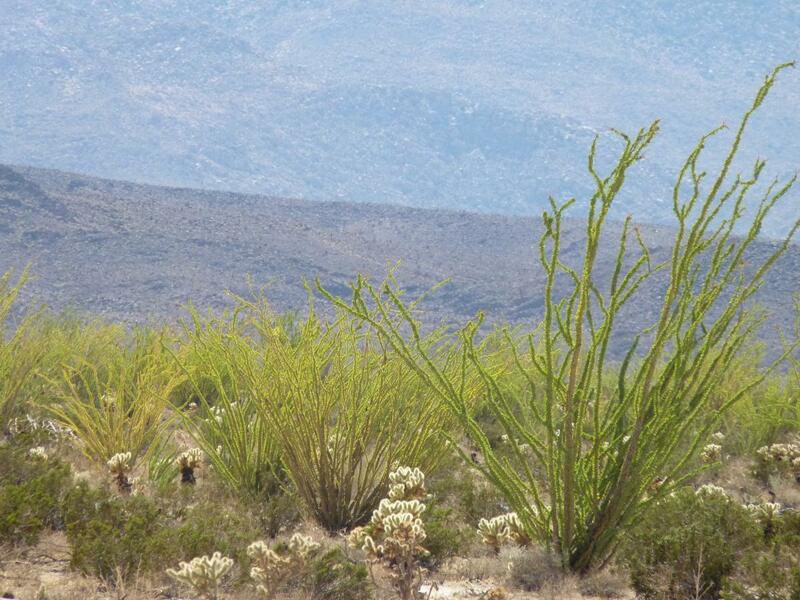 “We want the public to know that several conservation groups are not planning to go down easily on the Interior Department’s plan to destroy up to 20 million acres of southwest deserts, not even including the wind projects,” Terry Weiner of the Desert Protective Council in San Diego told ECM. DPC is a co-founder of Solar Done Right, one of the environmental groups that filed a protest. As of July 2012, eleven solar projects on over 36,000 acres had been approved on public lands. The projects range from 618 to 7,025 acres, with the average power plant exceeding 3,300 acres. As of July, pending proposals numbered 76, and would cover a total of 695,387 acres of public land. The scale, intensity, and pace of development on public lands are unprecedented. Three people arrested after an environmental group dropped a banner on Tower Bridge have been released on bail. 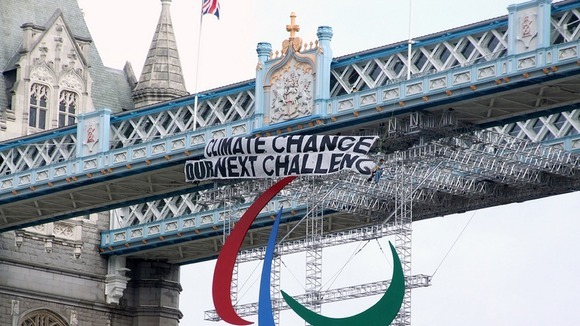 The bridge in south-east London was closed for over an hour on Saturday after the stunt by climate group Climate Siren. City of London Police said a man and a woman were arrested on suspicion of causing criminal damage and a public nuisance. A man was arrested for assisting them. 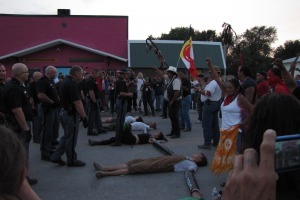 Women of the Oglala Lakota nation along with activists from Deep Green Resistance, AIM Grassroots, Native Youth Movement, Un-Occupy Albuquerque, Occupy Lincoln, and Rocky Mountain Peace and Justice Center took part in a march from Billy Mills Hall in Pine Ridge into White Clay to protest against the predatory liquor industry present there. After the march and speeches members of Deep Green Resistance locked down and blockaded the road into White Clay. 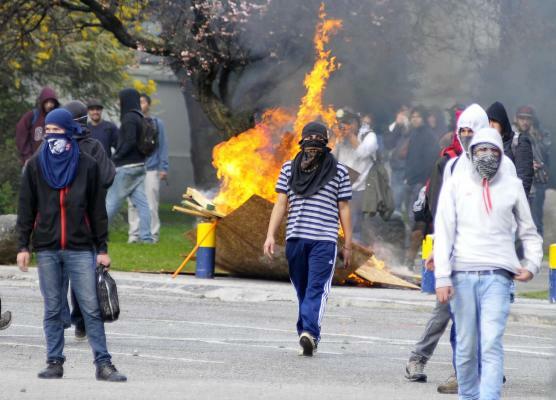 Last week in Santiago between police and tens of thousand of demonstrators demanding education reform. The rally was one of the largest in recent weeks, with between 50,000 and 130,000 protestors, according to police and protest organizers. While some danced to the rhythm of drums, thousands of others, masked and wearing hoods, followed the procession and attacked police with sticks and stones. The police responded, as they have in the past, with tear gas and water cannons. 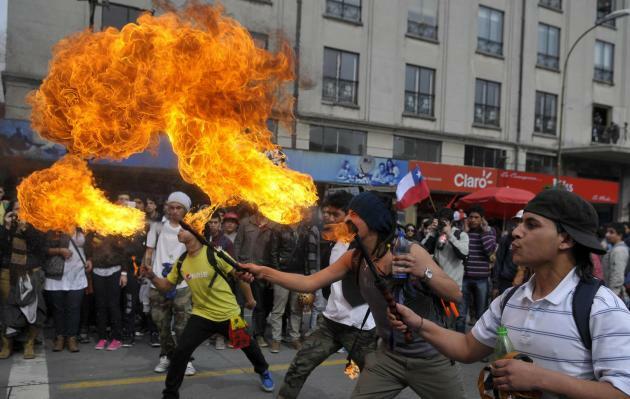 Fire breathing Chileans in the streets! The students were backed by members of the Unified Workers Federation, the country’s foremost union, which called on members to join the march. Public education in Chile suffered from sharp cuts in funding during the 1973-1990 dictatorship of Augusto Pinochet, leaving a system that favors expensive private schools that are out of the reach of the poor. Vermin Supreme 2012 at the DNC.. Vote in an honest scumbag for a change. And don’t forget to brush your dam teeth!